Click on the video to see the slide-pack from this recently delivered webinar, facilitated by PASA in Australia and globally by GBTA in the US. In no other supply category is there such a large gap between the words and numbers that you receive in the offers from suppliers, and the information that you need to assess those offers. Airline offers don’t even come close to enabling accurate calculations and comparisons. What you get is a set of discounts with conditions. Fair enough. But what do you apply them to? And how available are they. These second and third layers can make a big difference to the outcome. And then there are the soft benefits and service and qualitative differences to cover. You need a good model. Click on the video to see this the slide-pack from this recently delivered webinar, facilitated globally by GBTA in the US. what’s behind very low TMC fees? This webinar delves into the revenue sources and business models of the TMC to better understand commercial fee offers that seem to be below operating costs. Indeed, there have been numerous incedences of zero booking fee offers. We are joined by KBB Partners of New York to consider the explanations and implications. 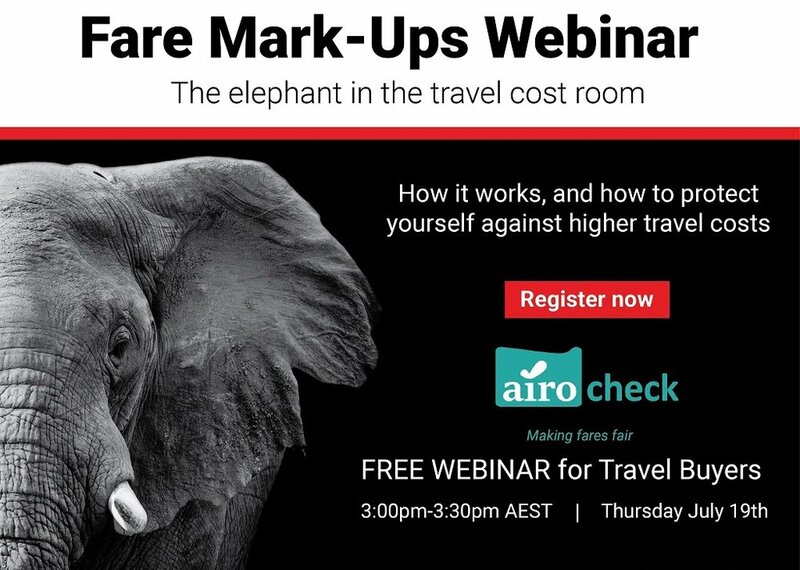 The webinar features charts showing generic fee levels in the market, and takes a look at TMCs’ revenue from airline, hotel and other commissions. That doesn’t seem to explain it. Yet TMCs are profitable businesses. Every travel buyer should know the business model of the TMC given its central and influential position at the junction of the travel supply chain. Click on the images to go to the PASA download sites, open to all PASA and GBTA members. 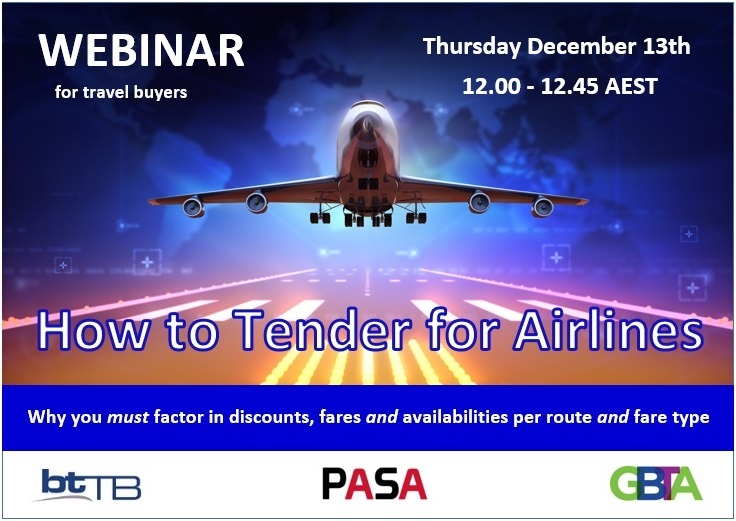 The webinars are: “How to Tender for Airlines” and “How Fare Mark-Ups Can Increase Your Travel Costs”. The following is a selection of recently published articles by Butler Caroye. Please click on an item to email a request for the article, free to all travel buyers. We have an archive of over 100 published articles. If you have a travel management issue or a topic you’d like to see discussed, let us know. We probably have it covered. If not, we’ll look into it for you. The articles with the black icon generated particular feedback and discussion. The graphics are “Images of Australia”, some from a microscope, some from a satellite. Personalised booking systems are the “big new thing”. But could they be personalising you away from best value fares and rates? Is the algorithm really your friend? … about Procurement. The procurement role and value was laid bare by the questions of a fifteen year old. Exactly what is it that procurement does? She made me think. Advice to suppliers based on the faux pas and follies I've seen over the years, that's also useful to procurement managers wading through the torrent of words in tender responses. The travel tender process in particular presents an opportunity to include other staff and foster a broader understanding and appreciation of procurement throughout your organisation. Several TMCs are focussing their sales efforts on smaller businesses. Here are several tips on the main things SMEs can do to get good deals under the heat of the sales spotlight. Here are ten things that happen in the travel supply chain that you really want to avoid, prevent or at least be aware of. Hidden fare mark-ups are obviously bad for the client. But they're also bad for airlines, and even for the TMC. That's everyone in the market place. A conflicted and opaque supply chain like travel needs a lot of category knowledge to manage well. Here we discuss where to get it, and how to keep it. Too often organisations acquire the know-how and lose it. This presentation was delivered in San Diego in 2018 under the Airocheck banner. It explains hidden arbitrary fare mark-ups … what they are, how they occur, the systems that enable them, their prevalence, and the impact on the travel buyer hip pocket. Airocheck is Butler Caroye’s sister company that conducts detailed fare, fee and rate audits using irretutable settlement data-of-truth. A basic principle of our business is that we need to help procurement managers to succeed … by increasing the value of your travel supply, by increasing the company’s return on its investment into procurement, and by delivering category knowledge to the procurement team. If you don’t succeed, we don’t either.